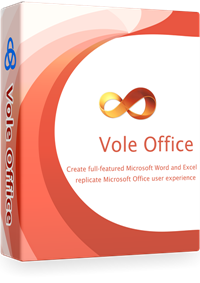 Vole Office is a light Microsoft Word and Excel editor, it is easy to use and low in Price. Vole Office help you create full-featured Microsoft Word DOCX and Microsoft Excel XLSX document and replicate Microsoft Office user experience.Vole Office is easy to use, inexpensive and fully compatible with Microsoft Office Word and Excel, making it the best choice for individuals and companies. Looks simple and it’s free but… Nothing new? As an option for Microsoft Office, Vole Office its a… Weak option. It’s main problem is the lack of something new. The mayority of the options from the Microsoft program are included here, but many others are not. A good example are styles and designes, because it only includes 3 very basics. As for Excel, the differences are very specific. In general it includes the same options and has the same capabilities with some very puntual exceptions. Vole Office consume A HUGE amount of resources when it starts and while it’s running, making it a bad option for office machines or computers that are not equiped with a decent hardware capable of run it and execute any other program at the same time (like a web browser). It also executes Office and Excel at the same time for some reason. Vole Office has only 6 languages, making it difficult and almost impossible to work in documents in any file with a language not included (as in my case with Spanish). Becoming a clear disadvantage compared to the software offered by Microsoft. This could be a demanding complaint, but the design of Vole Office is too outdated and unpleasing to the eye compared to the minimalistic and attractive styles of today. In short. This is not the best option to replace Microsoft Office. Although I believe that you are an independent reviewer, I still hope that you can publish your detailed test data. This will not only increase the credibility of your article, but also help the reader understand the truth.